Sheng Siong is one of my favorite company in my stock portfolio. It is such a fantastic growth company with zero debt. See how the stock continues the uptrend over the 5 year period. For Sheng Siong who is expanding aggressively by opening more and more stores in Singapore, hiring manpower for new stores is a continued challenge due to the current labour crunch in the market. This is also a common challenge among Jumbo and Breadtalk businesses where the nature of the business in the service industry is labour intensive. Today I happen to came across an article published in May 2016 which describes how Sheng Siong uses innovation to solve its manpower woes. 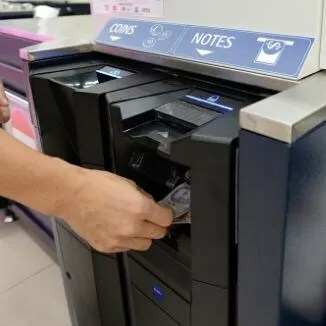 The article wrote about Sheng Siong introducing Glory’s CASHINFINITY™ secure closed cash management solution to its stores. The self payment kiosk solution will be rolled out to its stores island wide. The payment kiosk accepts cash payment from customers and dispenses change. This solution fits Sheng Siong perfectly as most of its customers are elderly folks who doesn’t know how to use or own credit cards. This is innovative use of technology to reduce manpower costs!